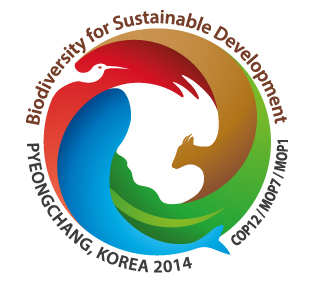 Preface: The Gangwon Declaration on Biodiversity for Sustainable Development (2014) was adopted by the twelfth meeting of the Conference of the Parties (COP 12) to the Convention on Biological Diversity (CBD), Pyeongchang, Gangwon Province, Republic of Korea, 16 Oct., 2014. The 12th meeting of the Conference of the Parties (COP 12) to the Convention on Biological Diversity (CBD) convened concurrently with the first meeting of the Conference of the Parties serving as the Meeting of the Parties to the Nagoya Protocol on Access and Benefit-sharing (COP/MOP 1) from 6-17 October 2014, in Pyeongchang, Republic of Korea. (v) strategy for resource mobilization. During the 12th meeting of the Conference of the Parties (COP 12) to the Convention on Biological Diversity (CBD) parties along with the international community including partners of the Biodiversity and Community Health (BaCH) Initiative discussed about the role of biodiversity for sustainable development. In line with this COP’s theme ‘Biodiversity for Sustainable Development’ participating Ministers of Environment along with other high-level delegates stressed the mutually supportive nature of the Aichi Biodiversity Targets and the Sustainable Development Goals (SDG). 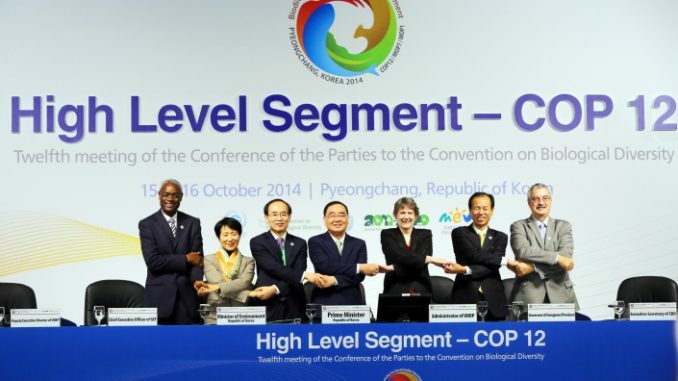 This message was conveyed through the Gangwon Declaration – the main outcome of the High-Level Segment of COP 12. 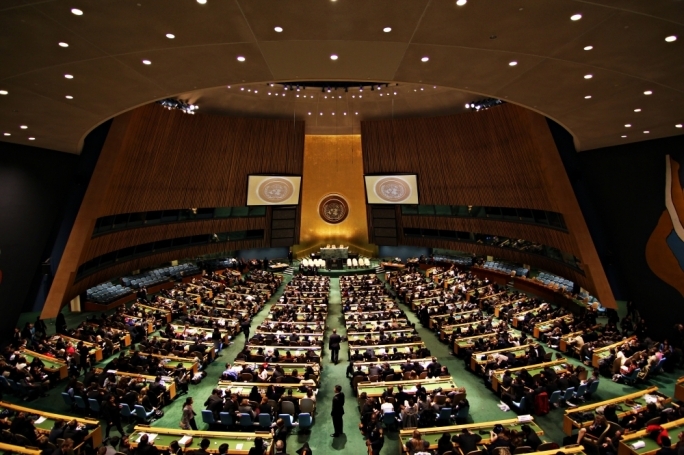 The high-level meeting of a U.N. biodiversity conference adopted the Gangwon Declaration on October 16. 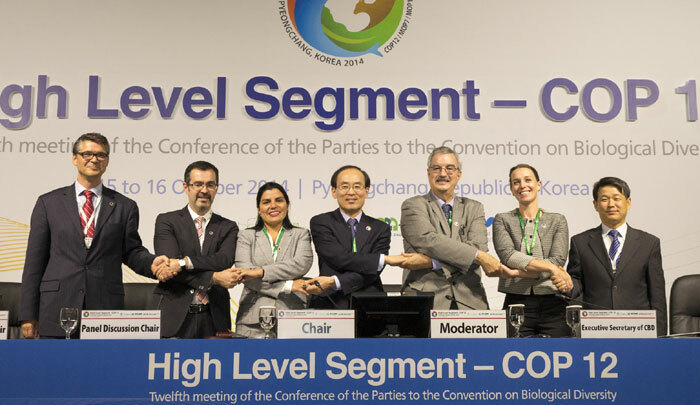 The declaration was adopted at the High Level Segment of the Convention on Biological Diversity (COP12), which took place in Pyeongchang, Gangwon-do (Ganwon Province), on October 15 and 16. In the declaration, signatories agreed to make biodiversity a major issue in future discussions for setting sustainable development goals and the Post-2015 Development Agenda of the U.N. They expressed support for the Pyeongchang Roadmap in order to achieve world biodiversity goals, known as the “Aichi Targets,” by 2020. Participants also pushed for negotiations to make progress on mobilizing finances in this regard. Considering the importance of the timing of the international gathering, COP 12 adopted the new declaration, its first over the past ten years, at the convention level. Korea proposed the declaration, as it was the convention’s host country. Final agreement on the declaration was made after one year’s preparation and negotiation. 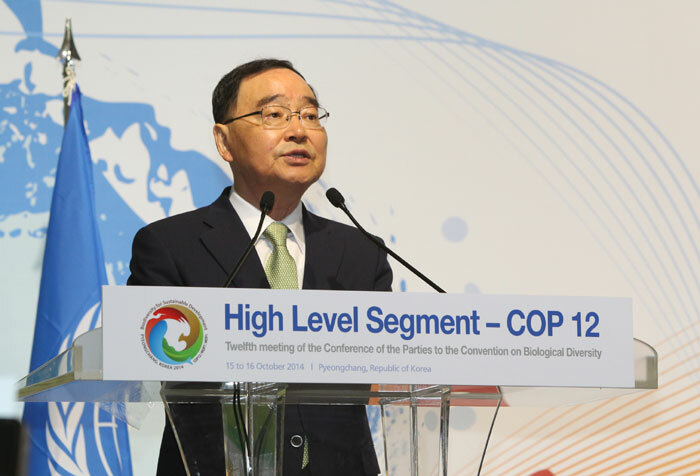 The Gangwon Declaration covers major issues of the conference and initiatives of environment ministries worldwide, who urged countries to ratify the earlier Nagoya Protocol and emphasized the mainstreaming of biodiversity. The declaration also contains a message welcoming the “Peace and Biodiversity Dialogue Initiative” proposed by Korea for the conservation of biodiversity in worldwide border areas. 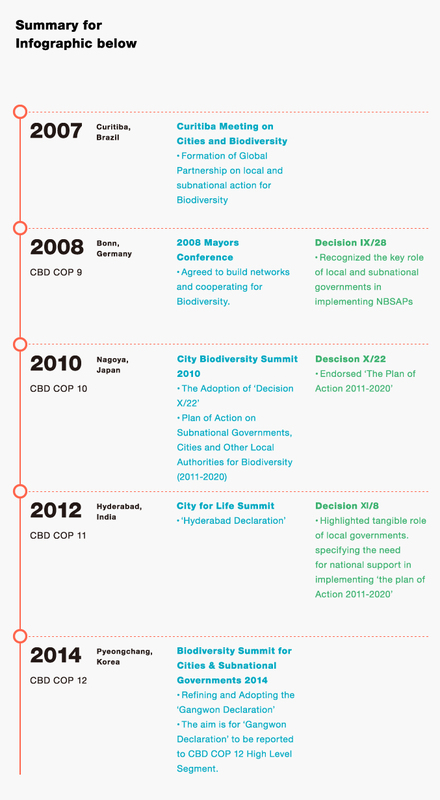 The declaration holds significance because this is only the fourth adoption of a declaration in the COP 12’s history. The Korean Ministry of Environment said that this gathering was held at a critical time to decide whether to implement a 2011-2020 strategic plan for biodiversity and to achieve the goals of the 2020 Aichi Targets. 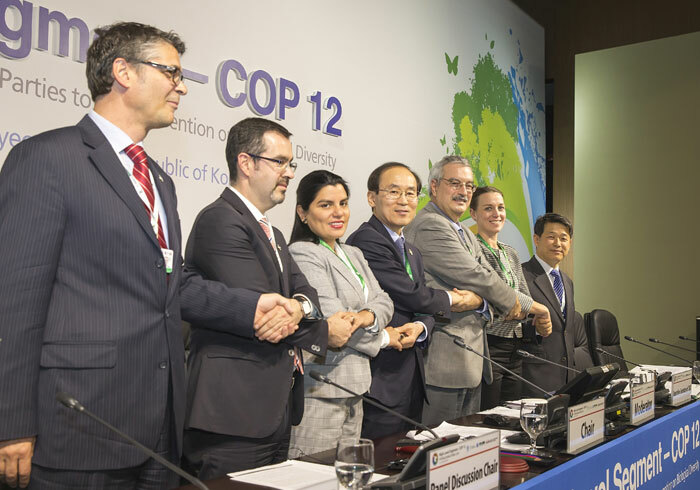 The ministry expects the adoption of the Gangwon Declaration to present a broad direction for Korea to play the role as chair of the COP 12 over the next two years. The Gangwon Declaration aims to send a strong message for the fundamental role of the Strategic Plan for Biodiversity 2011-2020 and its Aichi Biodiversity Targets and Vision for 2050 to the post-2015 development agenda. As such one of the decisions (Decision XII/5) highlights the need to take further actions for food security and nutrition. Bioversity International, one of the BaCH Initiative’s key partners has been raising awareness for and generated evidence on the linkages between biodiversity conservation, food and nutrition to improve human nutrition and well-being at large over the last years. Amongst others, Bioversity International is anchoring the Biodiversity for Food and Nutrition Project – a multi-donor project in Brazil, Kenya, Sri Lanka and Turkey to mainstream biodiversity, food and nutrition. The Minister of Environment of the Republic of Korea has presented to UN Secretary-General Ban Ki-moon the three major outcomes of the twelfth meeting of the Conference of the Parties to the Convention on Biological Diversity (CBD COP 12) on the role of biodiversity for sustainable development, for transmittal to the 69th session of the UN General Assembly (UNGA). 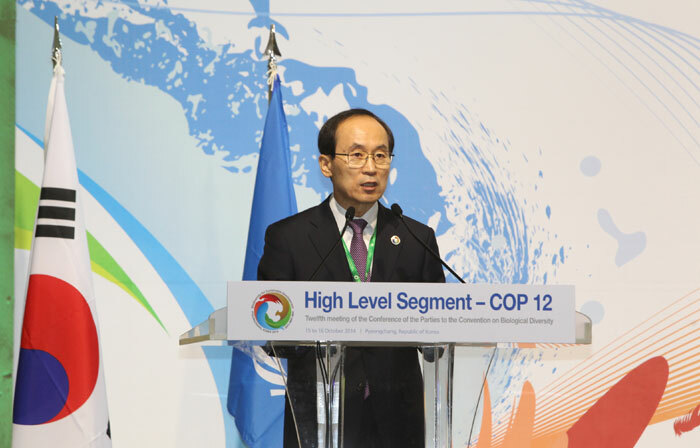 The high-level ‘Gangwon Declaration on Biodiversity for Sustainable Development’ and two COP decisions on ‘Integrating biodiversity into the post-2015 development agenda’ and ‘Biodiversity for poverty eradication and sustainable development’ were presented in connection with upcoming negotiations on the post-2015 development agenda. 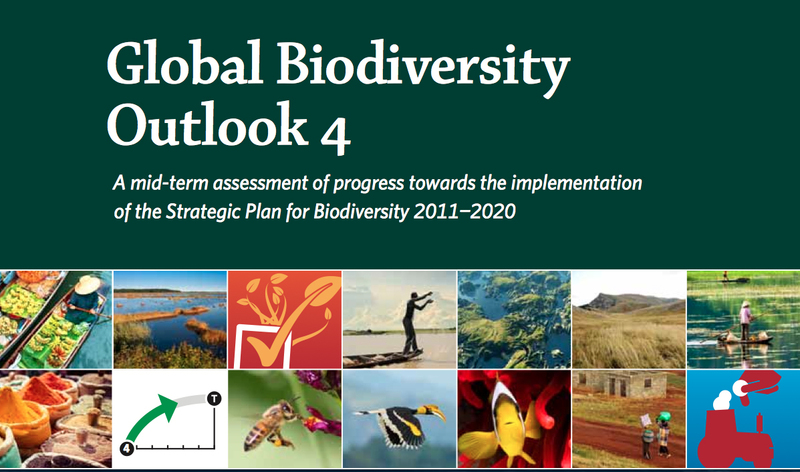 Global Biodiversity Outlook (GBO) is the flagship publication of the Convention on Biological Diversity. It is a periodic report that summarizes the latest data on the status and trends of biodiversity and draws conclusions relevant to the further implementation of the Convention. The fourth edition of the Global Biodiversity Outlook was officially launched on the opening day of the Twelfth Meeting of the Conference of the Parties to the Convention on Biological Diversity (COP 12) in Pyeongchang, Korea. The report draws on various sources of information to provide a mid-term assessment of progress towards the implementation of the Strategic Plan for Biodiversity, an issue which will be discussed during COP-12. 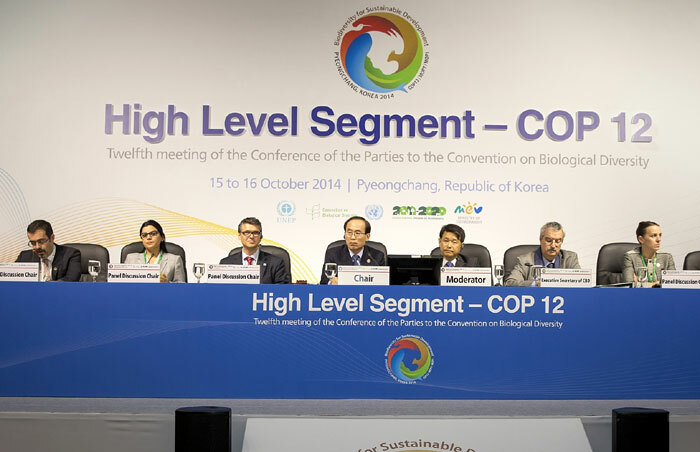 The twelfth meeting of the Conference of the Parties to the Convention on Biological Diversity, Pyeongchang, Gangwon Province, Republic of Korea, 12-17 Oct., 2014. The Declaration declares the implementation of the Strategic Plan for Biodiversity 2011-2020 and its Aichi Biodiversity Targets, which are to be achieved by the end of this decade. The Declaration adopted gave a mid-term evaluation to the UN Decade on Biodiversity (2011-2020) initiative, which aims to promote the conservation and sustainable use of nature. The Declaration adopted the Pyeongchang Roadmap 2020 for the enhanced implementation of the Strategic Plan for Biodiversity 2011-2020 and achievement of the Aichi Biodiversity targets (known as “Pyeongchang Roadmap 2020“), which addresses ways to achieve biodiversity through technology cooperation, funding and strengthening the capacity of developing countries. The Declaration calls on all Parties to integrate implementation of the Strategic Plan and Aichi Biodiversity Targets with the implementation of the targets and vision for 2050, and post-2015 agenda and other relevant policy and planning measures. Hoffmann, M., Hilton-taylor, C., Angulo, A., Böhm, M., Brooks, T.M., Butchart, S.H.M., Carpenter, K.E., Chanson, J., Collen, B., Cox, N. a., Darwall, W.R.T., Dulvy, N.K., Harrison, L.R., Katariya, V., Pollock, C.M., Quader, S., Richman, N.I., Rodrigues, A.S.L., Tognelli, M.F., Vié, J., Aguiar, J.M., Allen, D.J., Allen, G.R., Amori, G., Ananjeva, N.B., Andreone, F., Andrew, P., Aquino Ortiz, A.L., Baillie, J.E.M., Baldi, R., Bell, B.D., Biju, S.D., Bird, J.P., Black-Decima, P., Blanc, J.J.J., Bolaños, F., Bolivar-G, W., Burfield, I.J., Burton, J. a., Capper, D.R., Castro, F., Catullo, G., Cavanagh, R.D., Channing, A., Chao, N.L., Chenery, A.M., Chiozza, F., Clausnitzer, V., Collar, N.J., Collett, L.C., Collette, B.B., Cortez Fernandez, C.F., Craig, M.T., Crosby, M.J., Cumberlidge, N., Cuttelod, A., Derocher, A.E., Diesmos, A.C., Donaldson, J.S., Duckworth, J.W., Dutson, G., Dutta, S.K., Emslie, R.H., Farjon, A., Fowler, S., Freyhof, J.J., Garshelis, D.L., Gerlach, J., Gower, D.J., Grant, T.D., Hammerson, G. a., Harris, R.B., Heaney, L.R., Hedges, S.B.B., Hero, J.-M.M., Hughes, B., Hussain, S.A., Icochea M, J., Inger, R.F., Ishii, N., Iskandar, D.T., Jenkins, R.K.B., Kaneko, Y., Kottelat, M., Kovacs, K.M., Kuzmin, S.L., La Marca, E., Lamoreux, J.F., Lau, M.W.N., Lavilla, E.O., Leus, K., Lewison, R.L., Lichtenstein, G., Livingstone, S.R., Lukoschek, V., Mallon, D.P., McGowan, P.J.K., McIvor, A., Moehlman, P.D., Molur, S., Muñoz Alonso, A., Musick, J. a., Nowell, K., Nussbaum, R. a., Olech, W., Orlov, N.L., Papenfuss, T.J., Parra-olea, G., Perrin, W.F., Polidoro, B. a., Pourkazemi, M., Racey, P. a., Ragle, J.S., Ram, M., Rathbun, G., Reynolds, R.P., Rhodin, A.G.J., Richards, S.J., Rodríguez, L.O., Ron, S.R., Rondinini, C., Rylands, A.B., Sadovy de Mitcheson, Y., Sanciangco, J.C., Sanders, K.L., Santos-Barrera, G., Schipper, J., Self-sullivan, C., Shi, Y., Shoemaker, A., Short, F.T., Sillero-Zubiri, C., Silvano, D.L.D.L.D.L., Smith, K.G., Smith, A.T., Snoeks, J., Stattersfield, A.J., Symes, A.J., Taber, A.B., Talukdar, B.K., Temple, H.J., Timmins, R., Tobias, J. a., Tsytsulina, K., Tweddle, D., Ubeda, C., Valenti, S. V., van Dijk, P.P., Veiga, L.M., Veloso, A., Wege, D.C., Wilkinson, M., Williamson, E. a., Xie, F., Young, B.E., Akçakaya, H.R., Bennun, L., Blackburn, T.M., Boitani, L., Dublin, H.T., da Fonseca, G. a B., Gascon, C., Lacher, T.E., Mace, G.M., Mainka, S. a., McNeely, J. a., Mittermeier, R. a., Reid, G.M., Rodriguez, J.P., Rosenberg, A. a., Samways, M.J., Smart, J., Stein, B. a., Stuart, S.N., Boehm, M., Vie, J.C., quino Ortiz, A.L., Bolanos, F., Bolivar, G., Fernandez, C.F.C., Hedges Blair, S., Icochea, M., Munoz Alonso, A., Rodriguez, L.O., de Mitcheson, Y.S., Akcakaya, H.R., Lacher Jr., T.E., Paul Rodriguez, J., B+¦hm, M., Vi+¬, J.C., Ortiz, A.L.A., Bola+¦os, F., Alonso, A.M.M., Rodr+¡guez, L.O., Paul van Dijk, P., Ak+oakaya, H.R., Stuart, H.M., Nicholas, K., Luz, A., Rachel, D., Nigel, J., Mitcheson, Y.S. De, Dijk, P.P. Van, Resit, H., Fonseca, G. a B., Jr, T.E.L., and Russell, A., 2010. The Impact of Conservation on the Status of the World ’s Vertebrates. Science, 330 (6010), 1503–1509. Nayar, A., 2010. World gets 2020 vision for conservation. Nature, 468 (7320), 14–14.